I had a day long cruise of the Murray from Goolwa to the mouth and then along the Coorong for quite a few kilometres. 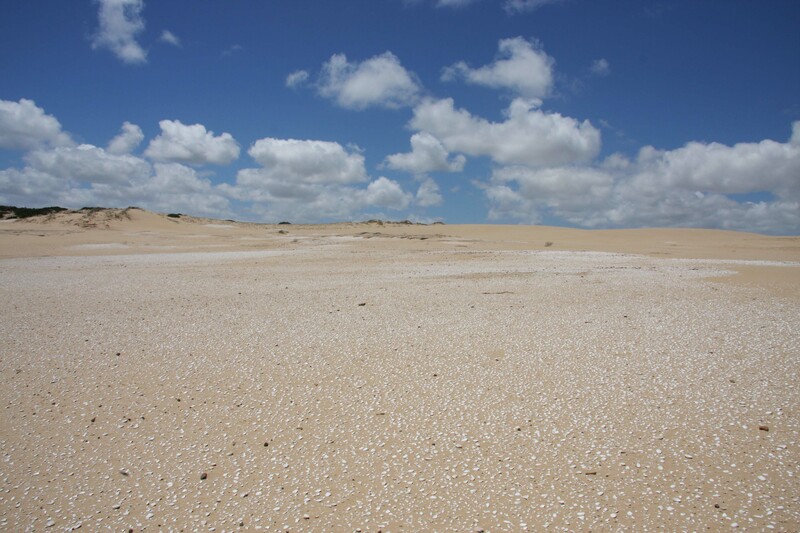 Above Goolwa is Lake Alexandrina which is massive – 580 square kilometres. It used to be sea water but a series of barrages was finished in 1940 and the Lake became fresh water and is used for irrigation. Barrages are like a weir, but because they separate sea and fresh water they are called barrages. One of the barrages is 3 Km long all built with pick and shovel. At the moment there is 89,000 mega-litres per day flowing into and out of the lake, that’s 89 olympic swimming pools per day. Over 100,000 mega-litres per day is called a flood. When Marg and I were here in 2011 there were about 6 gates open in the barrages, this time there were around 30 open in the main Goolwa barrage and lots open in the four other barrages that seal off creeks and inlets. So there is much more water this time, in fact when the Spirit of Coorong was in the Murray mouth the water was measured at 36 feet deep. The mouth has moved 6-8 Km over the last 1000 years and about 1 km since the 1970s. It closed for the first time in 1981 and they now dredge sand to keep it open when the Murray flow is low. 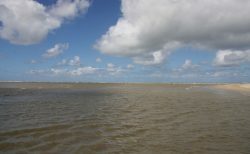 The white line in the water at the Murray mouth is where the water of the Coorong meets the water from the Murray. 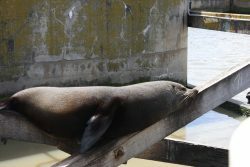 There was heaps of bird life to enjoy plus NZ fur seals around the Goolwa barrage. There were a lot of migratory birds including sandpipers the size of sparrows that have just flown in from Siberia, quite amazing. We had to use a lock to get through the barrage as there is a 30 cm difference in the levels across the barrage. 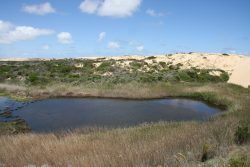 During the drought that broke in 2010, the lake was at least a metre below the sea level and water seepage through the dunes caused the lake to become slightly salty. Later on in the drought much of the lake dried up and only the channels held water. To stop acidification of the dry lake bed they used crop dusting planes to spread 600 tonnes of lime on the exposed bed to drop the acid level. As a last resort they were going to flood the lake with sea water, but fortunately the drought broke. 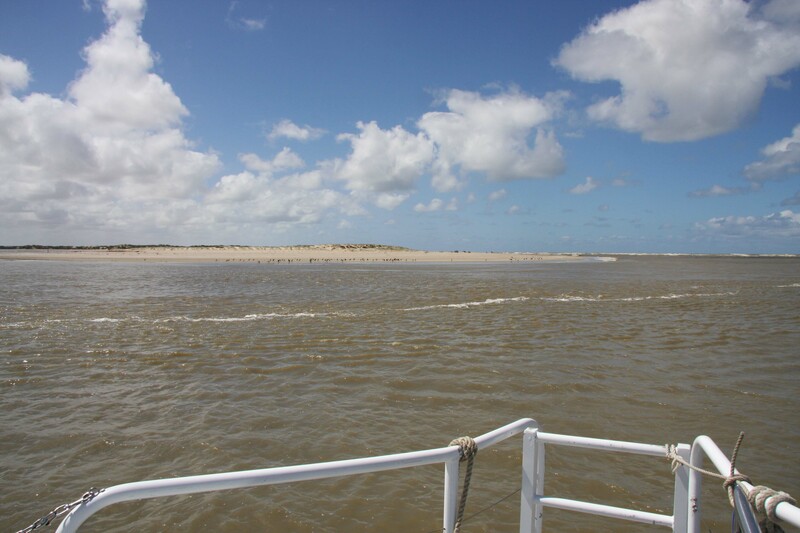 The water in the lake and Murray is quite brown and when you pass the last open barrage you can see a distinct line where the fresh water meets the salt water of the Coorong (4 times as salty as the sea, but that should change with all the water flowing down the Murray). This line shows clearly in the photo of pelicans below. 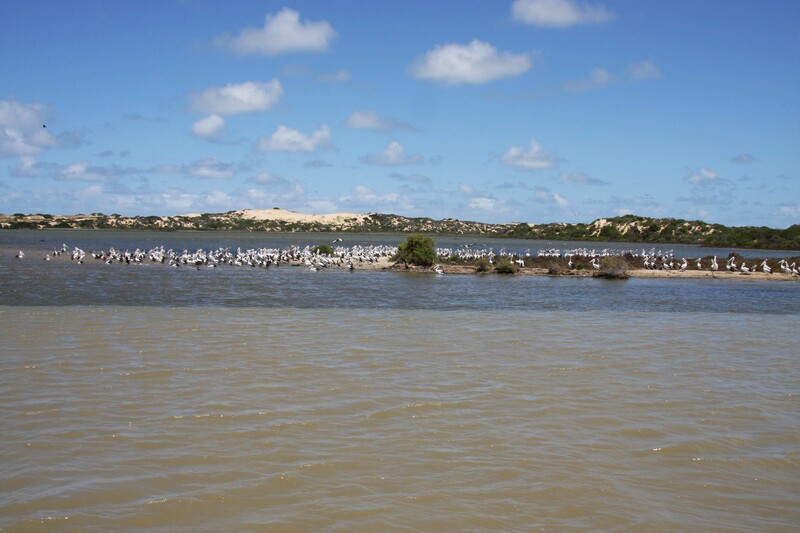 The Coorong is 130 Km long and ranges up to a kilometre wide. 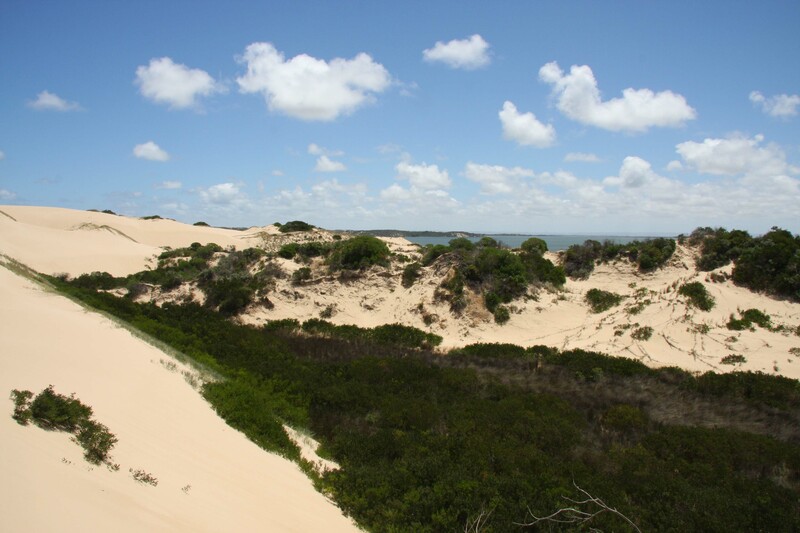 The line of sand dunes between the Coorong and the ocean is narrow at places, 100-200 metres and very wide up to 4 km wide. We landed in a couple of places and walked across the dunes. The first stop took us across to the ocean and Goolwa beach, where the pipis usually are. However because of the amount of fresh water entering the ocean most of them have moved 50-70 Km down the beach. 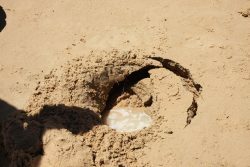 The commercial fishers have to travel up to 70 Km now each day to catch them, and they use the traditional foot wiggle to find the pipis, or cockles as they are called here. The amount they are allowed to catch as a group changes according to pipi numbers, but is usually around 450-500 tonne per year. The pipis are retailing at $20 per Kg. The commercial fishers also use nets from shore to catch Mulloway. Our guide was part aboriginal and was able to show us some bush food plants along the walk. We also saw a fresh water small lake in the dunes. Before lunch we were served a starter of a dozen pipis cooked in garlic, onions, hoisin and chilli sauces, with cream and wine, they were delicious. Lunch came in a prepared box of salad with macaroni salad, coleslaw, 3 cuts of cold meat, chopped chicken, hard boiled egg, tomato and lettuce, plus a roll, cheese and biscuits and a chocolate mint. The only thing missing was a glass of wine! 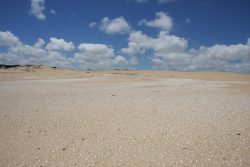 After lunch we stopped at Cattle Point in the National Park and walked through the dunes to an aboriginal midden of pipi shells. The midden was massive and clearly had been occupied for millennia. The midden was at least 200 m in each direction and reported to be 2 m deep, how many pipis is that! And the aborigines had to walk 2 Km to the beach to gather them. There were also some buried human remains on the site so we had to be guided on where we could walk and sometimes it was in single file. 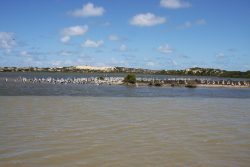 Because of the plentiful supply of game, fish and pipis the aborigines, Ngarrindjeri, were not nomadic. The guide also dug a small well about 30 cm deep in a depression in the sand which quickly partly filled with water. I drank a little and it tasted fresh and pure, but you had to be careful not to stir up the sand though. 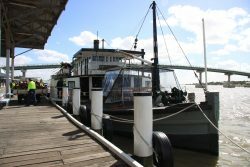 We then returned to Goolwa after a very enjoyable well run day. I pack up tomorrow and move to Nelson and maybe Glenelg National Park. Wow sounds like an interesting place and a worthwhile tour! And the pippis for lunch sounded delicious! The Coorong was a very favourite place for mum as well, the pipis were great, maybe I will try to buy some pipis for when we entertain Adam and Gerard. I am in Nelson now for 4 days and thinking I will head home after that. I will check out Pritchards, but I think I feel like heading home. Tomorrow I will go a cafe in Port MacDonnell that mum and I went to last time we were here.